I grew up in a farming community in Oregon. There were picturesque pastures with cows and sheep, houses nestled in evergreen forests and oak groves, and the occasional tractor meandering down the road. We even had a little red barn on our property. When it wasn’t raining, we’d bundle up and go for a walk around the loop. That’s what we called our neighborhood—a three-mile circle with a house every few acres or so. We knew most of our neighbors by name in our sparsely populated community, and everyone walked the loop, young and old. It took an hour and it was a great opportunity to chat, drop in on a neighbor if so inclined, and take in the scenery. September was the best month to walk the loop because it was blackberry season, and the berries grew wild on the side of the road. We’d grab an empty coffee tin and pick them as we passed by the brambles. By the time we looped back again our tins would be filled to the brim, and our moms would make pie or jam. Sometimes we’d drop them on top of ice cream at night or cereal in the morning. Plump, fat blackberries, impossibly sweet, but with that tart kick at the end. When the brambles had been picked clean by those on foot, we’d ride horses so we could reach the top branches. If the blackberries were still out of reach, we’d stand on the horses’ backs. Someone would always reach deep within the sharp brambles for the plumpest prizes, pulling out a bloodied arm along with the blackberries. Nobody really minded the “battle scars,” it was just an Oregon rite of passage. “Ah, I see you’ve been picking blackberries!” was a common phrase. The scratches gave it away. That, and our purple-stained lips. Part of the fun of picking blackberries was sampling them fresh off the branches. On a hot day the blackberries were warm and extra sweet. I moved to California when I was nineteen, many years ago. I don’t get back to Oregon often, especially in September, so blackberries are very nostalgic for me. A few precious times over the years I got to pick those blackberries with my own young children. Now my kids are grown. Recently it was my birthday and my husband surprised me with a trip to Oregon, via an overnight train. We watched the magnificent solar eclipse on that train, and ended up at a sprawling Bed and Breakfast farmhouse in Carlton. At first, it was just my husband and me. Soon cars pulled up, and out popped my four kids, with one brand new spouse and one boyfriend! Another car pulled up with my dear childhood friend Ann, and her husband. 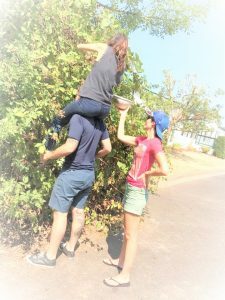 Picking blackberries the fun way! Ann had walked the loop many times with me when we were kids. She remembered how much I loved blackberries. It was late August, so the first batch of blackberries were already ripe. It turns out, my kids had picked blackberries, with the girls on the boys’ shoulders so they could reach the good ones on top. They had taken their berries to Ann’s house and they had all made a blackberry cobbler! That night, for my birthday “cake” they presented me with that blackberry cobbler, warm with candles and nostalgia and love. It brought tears to my eyes. 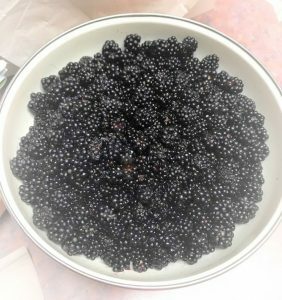 They even showed me a sequence of pictures; of them picking the blackberries, then the blackberries in a heaping bowl, then in Ann’s kitchen with flour and sugar and recipes and smiles. I blew out the candles and took a bite. It tasted like pure joy. It tasted like childhood. I looked around at all the sweet smiling faces, with blackberry stained lips and giggles, and I could see that everyone knew how I felt, because they felt it too. A step back into simpler times, where neighbors were friends and berries grew wild. It wasn’t just a blackberry cobbler. It was magic, and I’ll never forget it. I love to hear from my readers! If you enjoyed this story, please leave a comment and subscribe! Scroll down for more memoirs, poems, essays and stories!